A nondescript industrial center near Palomar Airport looks like every other in the vicinity. Yet, the nine-building Carlsbad Gateway Center at 5650 El Camino Real is vastly different. “We have 80 businesses that create, innovate, make, manufacturer, and sell,” says manager Toni Adamopoulos. Several businesses wholesale local foods, using full-scale county health department–approved kitchens; most have mini-restaurants, selling retail out of their unit’s storefront. Beer fans will find the Arcana Brewing Company; engineers who design storage units to be built worldwide; and an organic esthetician who advises that nothing goes on one’s face that isn’t good for you to eat. 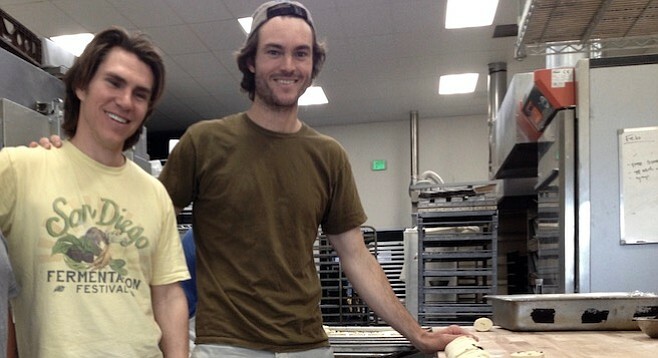 The Prager Brothers Bakery started when Louie Prager started making wood-fired pizza ovens in his family’s backyard. By 2012, having successfully sold their bread at local stores and farmers’ markets, the family decided it was time to move into a leased space. “Our whole house was covered with shipping and packaging,” said Prager. Because they strive for freshness, the company doesn’t sell outside of the county. “Our juice is always less than 18 hours old,” said Leamer. The pulp from the juicing is diverted to local farmers for composting. The industrial center houses other food manufacturers with retail followers in independent markets and small chains: Angel’s Salami and Truffles, Happy Pantry, Leap Coffee, Bitchin’ Sauce, Kombucha Culture are some of the brands. When center owners Judd and Christine Cornish purchased the center seven years ago, they wanted to start something different. They slowly closed out the leases of businesses that didn’t mesh with their vision (such as gymnasiums and auto repair shops). Adamopoulos said the Cornishes try to help out new tenants who have good business ideas. “Even during the recession, we had 95 percent occupancy,” said Adamopoulos. All the tenants we encountered smiled or exchanged pleasantries with Adamopoulos — not a usual tenant/building management relationship.